This Ralf Aust razor has a 5/8 carbon steel blade with satin finish, with jimping to the upper and lower tang. This version has a plain spine. It has the "Ralf Aust Solingen" mark on the tang and the "Solinger Handarbeit" - handmade in Solingen - mark on the blade. The blade has a form of Spanish point to it, but almost a wave shape rather than a crescent. The scales are made from horn and as every piece used is individual it makes each razor unique. 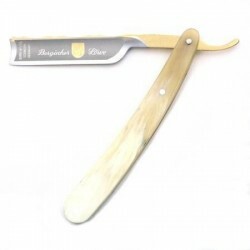 This is a elegant razor at a very reasonable price. All Ralf Aust razors have a full hollow ground blade. Please see full description about scale colouring. This Ralf Aust razor has a 5/8 carbon steel blade with satin finish, with jimping to the upper and lower tang. This version has a plain spine. It has the "Ralf Aust Solingen" mark on the tang and the "Solinger Handarbeit" - handmade in Solingen - mark on the blade. The blade has a form of Spanish point to it, but slightly more of a wave shape than a crescent. The scales are made from horn and as every piece used is individual it makes each razor unique. This is a elegant razor at a very reasonable price. All Ralf Aust razors have a full hollow ground blade. The scales are made from horn and as every piece used is individual it makes each razor unique. This is an attractive razor at a very reasonable price. Horn varies considerably in its colouring. The photograph is not necessarily of the razor available or representative of the stock we hold at time of purchasing. If you have specific requirements please contact us before ordering.